In the early critical moments of a cardiac arrest, the CPRmeter 2 helps first responders optimize CPR performance by providing real-time feedback on essential parameters of CPR. The consensus is clear, high-quality CPR has been shown to save lives.1,2 But, how do you know if your teams are consistently delivering high-quality compressions? The CPRmeter 2 is a simple tool you can use to ensure high-quality compressions are delivered from all the providers on scene.3,4 The CPRmeter 2 provides real-time measured feedback on depth, rate and release of CPR, while also enabling providers to self-evaluate their performance with event statistics on the spot. Learn how one EMS organization adopted CPRmeter 2 and changed the way they save lives. The CPRmeter 2 with QCPR technology provides real-time coaching and summative feedback to help rescuers optimize CPR performance in a clinical setting. Combined with the CPRmeter App, organizations can now drive quality improvement initiatives with detailed and shareable insights on CPR performance. 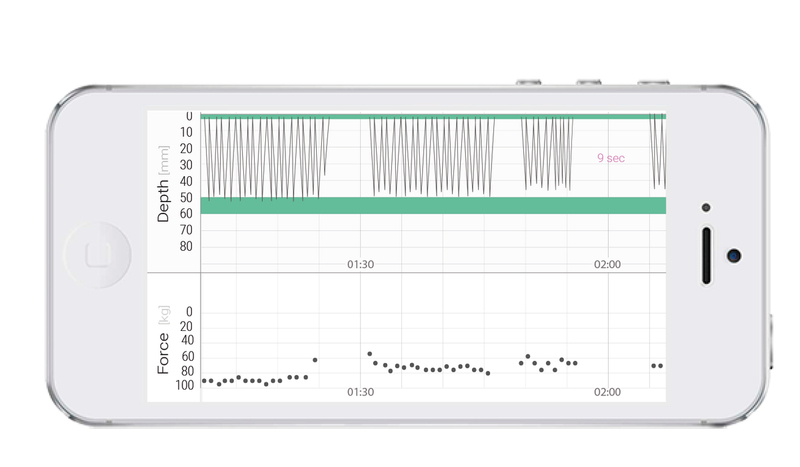 By rotating the view within the app, providers can examine visual feedback of their clinical or training performance. This detailed view delivers insights on the essential parameters of CPR. In addition, providers can annotate important events such as obtaining Return of Spontaneous Circulation. How does the CPRmeter 2 work? CPRmeter 2 has two embedded sensors: one measuring acceleration and another measuring force. A sophisticated microprocessor continuously measures both of these parameters during each compression, and special algorithms convert the collected data into meaningful information. The accelerometer measures the depth and rate of chest wall movement during each compression and converts it into distance travelled. The force sensor measures the force applied during CPR and is used for several purposes, the most important being to detect that pressure is not fully released between compressions i.e. provide feedback if the responder is leaning during CPR. CPRmeter 2 utilizes similar Q-CPR technology found in the Philips MRx, Philips XL+ and Philips FR3 defibrillators. Can CPRmeter 2 be used on infants or children? CPR feedback devices (CPRmeter) have been shown to improve the quality of CPR, which can ultimately save lives. We are now extending the indication for use of the CPRmeter 2 from >8 years to >1 year in the European market, following the European Guidelines (ERC) for children with Sudden Cardiac Arrest (SCA), so that children can get the same treatment as adults. Thus, there are two CPRmeters 2 with different age indications addressing different markets, affecting User Guides and product labeling. Can CPRmeter 2 remain applied to the patient’s chest during defibrillation? When a shock is required the CPRmeter 2 can remain applied to the patient's chest but compressions should be stopped, hands removed from the CPRmeter 2 and remain clear of all patient contact during defibrillation or when otherwise required, in accordance with a proper defibrillation protocol. What should I do if I am using CPRmeter 2 with a manikin which gives feedback? You should switch off the feedback given from the manikin. The CPRmeter 2 is a medical device which has been designed to provide the rescuer with CPR guidance for use in a wide range of patients with a range of complex chest properties. CPR manikins tend to have a simplified mechanical model of a chest, which are suitable for training of users in performing CPR. These two models therefore tend to have different measurement technologies and tolerances making it difficult to compare and follow both sets of feedback provided. Can I use CPRmeter 2 during transport of the patient in an ambulance? CPRmeter 2 is not intended for use in a moving environment, such as an ambulance. If used during patient transport, CPRmeter 2 may provide inaccurate feedback. If CPR is indicated in a moving environment, do not rely on CPRmeter 2 depth feedback during such conditions. It is not necessary to remove the device from the patient. Can the CPRmeter 2 be used in rain and other adverse weather conditions? Yes, the CPRmeter 2 has an IP 55 rating. Protected from limited dust ingress. Protected from pressure water jets from any direction. How long will the Battery last? CPRmeter 2 continuously monitors the power of its 2 AAA batteries. The low battery indicator will be shown during a CPR event if the remaining power is less than that required for an entire CPR event. The battery should last for a minimum of 10 episodes of 30 minutes continuous CPR. If CPRmeter 2 remains in standby mode then the battery should last 2 years and last for 2 30 minute CPR events. We recommend use of high quality alkaline batteries for use with the CPRmeter 2. Can I view the Q-CPR Quick Review event statistics after CPRmeter 2 has been switched off? The CPR event statistics are stored when CPRmeter 2 is turned off. When turned on again, the statistics from the stored CPR event can be reviewed. When CPRmeter 2 is used in a new CPR event, the preceding event’s statistics are removed from the Quick Review and the new event’s statistics are shown in Q-CPR Quick Review. Q-CPR is a trademarked technology platform developed by Laerdal to help train providers deliver guideline quality CPR in real-life emergencies. This technology offers objective measurement and corrective feedback on essential CPR parameters, as well as parameter logging for subsequent debriefing or analysis. How often should the patient adhesive be replaced? The Patient Adhesive should be replaced after clinical use, or every two years. How can I view the data from CPRmeter 2? The mobile App was created with the purpose of giving users the possibility to debrief in much higher detail, with accurate data that is simple to access, store, share and visualize. With just a few clicks, you can access in-depth debriefings immediately after events and share it with your team or quality managers. Rotate your phone to the side, and get a thorough view on the depth (mm), release, force (kg) and rate of each compression. Pinch and zoom in and out to analyze specific events. In the early critical moments of a cardiac arrest, the CPRmeter 2 helps first responders optimise CPR performance by providing real-time feedback on essential parameters of CPR. Foam pad with biocompatible adhesive on each side. 2.Nichol G, Thomas E, Callaway CW, Hedges J, Powell JL, Aufderheide TP, Rea T, Lowe R, Brown T, Dreyer J, Davis D, Idris A, Stiell I; Resuscitation Outcomes Consortium Investigators. Regional variation in out-of-hospital cardiac arrest incidence and outcome [published correction appears in JAMA. 2008;300:1763]. JAMA. 2008;300:1423–1431. 5.Link MS, Atkins DL, Passman RS, Halperin HR, Samson RA, White RD, Cudnik MT, Berg MD, Kudenchuk PJ, Kerber RE. Part 6: electrical therapies: automated external defibrillators, defibrillation, cardioversion, and pacing: 2010 American Heart Association Guidelines for Cardiopulmonary Resuscitation and Emergency Cardiovascular Care. Circulation. 2010;122(suppl 3):S706 –S719. 6.Edelson, D. P., B. Litzinger, V. Arora, D. Walsh, S. Kim, D. S. Lauderdale, T. L. Vanden Hoek, L. B. Becker, and B. S. Abella. 2008. Improving inhospital cardiac arrest process and outcomes with performance debriefing. Archives of Internal Medicine 168(10):1063-1069. 7.Zebuhr C, Sutton RM, Morrison W, Niles D, Boyle L, Nishisaki A, Meaney P, Leffelman J, Berg RA, Nadkarni VM. Evaluation of quantitative debriefing after pediatric cardiac arrest. Resuscitation. 2012;83:1124–1128.